A lot of players are reporting issues with the new anti-cheat client. 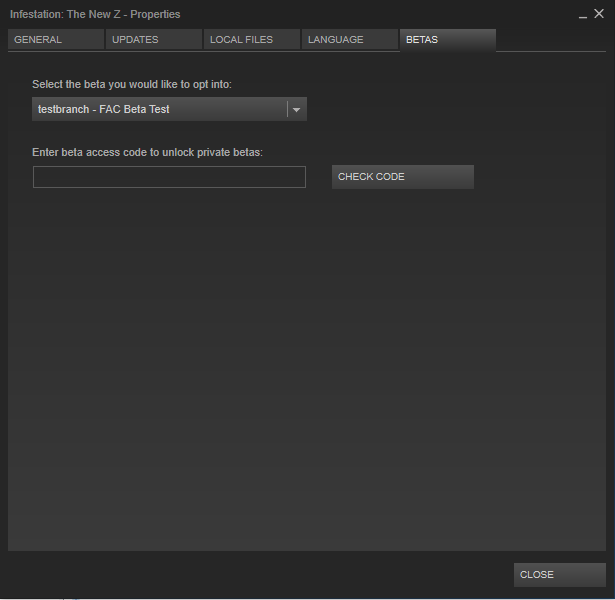 NOTE: You can select the "testbranch - FAC Beta Test" and leave the "Enter beta access code.." area empty. Please report all issues you have with the new FAC so we can provide a better experience for the full release. Fred. Still can't resolve this problem. After launch the Launcher NewZ from Steam the game dont start and write me that has New Update steam and closing..
after i restart steam nothing happen the game dont start and keep asking for update help me sir !!! Pop up of error when selected to "testbranch - FAC Beta Test"
Насколько это опасно для меня? Omg) Trojan-Banker.Win32-The main purpose of this Trojan is to steal your personal information related to your online banking and gain access to your Bank account. Your image isn't working, can you re-upload this? We are working on a solution for this! Maybe, you want to know, which buttons players press during the game? Maybe, you want to know,what players click during the game? That's weird, what antivirus is this?? we need to contact them asap. Maybe that's what you need. We submitted the file to Kaspersky, could you try again? I just updated the antivirus. But it still removes the Beta update. For the same reason as before. Allright, try again in a couple of hours, maybe their whitelisting service is slow. LOGUEI RECENTEMENTE NO SERVIDOR PRIVADO QUE ESTA EM MINHA POSSE E NOTEI QUE EM NATUS AIRFORCE ESTA COM QUANTIDADE DE ZOMBI REDUZIDAS E DE RESPAW TAMBÉM ISSO FOI ALTERADO COM A NOVA ATUALIZAÇÃO? I RECENTLY RECOGNIZED IN THE PRIVATE SERVER THAT IS IN MY POSSESS AND NEWS THAT IN NATUS AIRFORCE IS WITH QUANTITY OF REDUCED ZOMBIES AND BREATHING ALSO THIS HAS BEEN CHANGED WITH A NEW UPDATE? I just installed the beta to my game. I will get back to you with any issues I encounter. The new FAC is running smoothly on my system. I didn't experience any problem with the installation or with playing the game with it activated. I installed the new FAC but can not connect to any server, when the colorado map loads i get disconnected from server and i get a message "FAC kicked u" something like that. Plus when i try to set priority of the game to high from Task Manager to get better fps as i always did before, with previous fac, it does not let me. what is key beta test Fac 2.0 on stream client ?